Rain was pouring and I had not brought an umbrella. I was too much of a cheapskate to fork out Php 120 for an umbrella being sold at a sidewalk store near the gas station on the main thoroughfare. 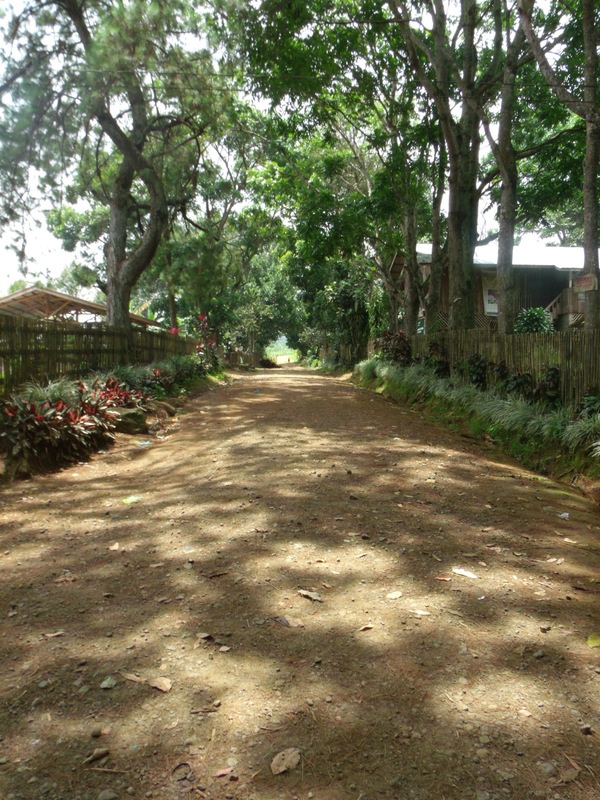 After all that dust on the day trip to Songco, the rain was refreshing, not that Malaybalay was hot in the evenings. It can get really chilly and I was glad I just took the cheap fan room at the lodge. Malaybalay had been quite a disappointment to me and being stuck in a smelly ukay-ukay store pretending to rummage around while waiting for the rain to stop seemed to just amplify that disappointment. I had expected too much from this place. The cool hills and outstanding vistas were more than a a couple of hour’s ride away and there really was nothing to do here except eat. Fortunately, a friend I had met pointed out to me a couple of restaurants he claimed served good food. I had eaten at Mindy’s the previous night and was disappointed. 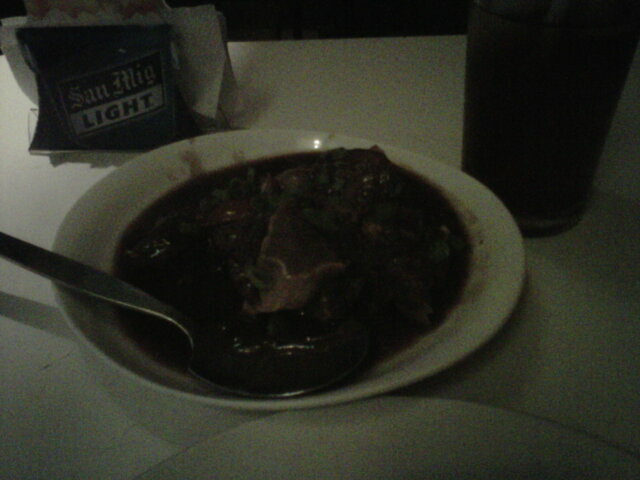 The adobo of baboy damo and its accompanying cup of rice was the most unpalatable dish I ever had. The adobo must have been cooked on the Pangasinan salt beds as it was downright salty your tongue could be pickled while chewing on it. I wished I had eaten at Jollibee instead. Maybe I just ordered the wrong dish as the people there seemed generally satisfied with what they were having— bowls of bulalo. I was still keen to give the local restaurants a try. After all, happiness in the form of Chicken Joy was just a few minutes walk should I be disappointed again. The rain had ceased a bit and I skeddadled out of the ukay-ukay and trying to keep myself dry while walking briskly under the leaking foyer of shops selling sundries and finally scooped in at tiny Le Village. This hole in the wall is more cafe than restaurant with its colorful walls and wooden chairs and tables that could sit around twenty people at most. The bar stools at the window had nice viewing opportunities though. Diego’s text that I try the Fish in Lemon Butter Sauce came too late. I had ordered a spaghetti with pesto and though it wasn’t bad it wasn’t really good either. There was not enough pesto and more than enough cream. The garlic bread had sugar in it and tasted no different from the commercial sugared toasties you can buy off the shelf in a grocery. This called for Plan B. The rain had stopped by the time I was through with my meal. Crossed the plaza and headed to a block down from the lodge and into the cozy interiors of Isabell’s Cafe. Any restaurant with comfortable booth or sofa seating get plus points from me. A good meal can only be complemented by comfortable seating. 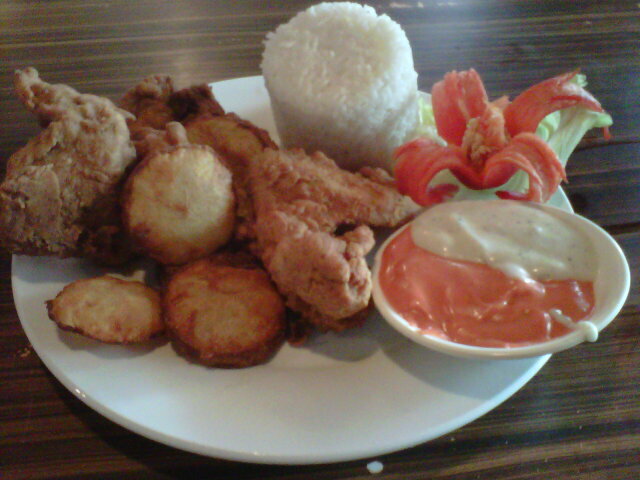 Isabelle’s 3-pc chicken which I was a bit hesitant to order as it was placed under “Barkada Feast” (whaaaaaaatttttt?!!!!) was nothing to really write home about. It was crispy though and came with a side order of potato wedges. It was good value at Php 120 considering it was almost the same price as the pasta I had earlier. 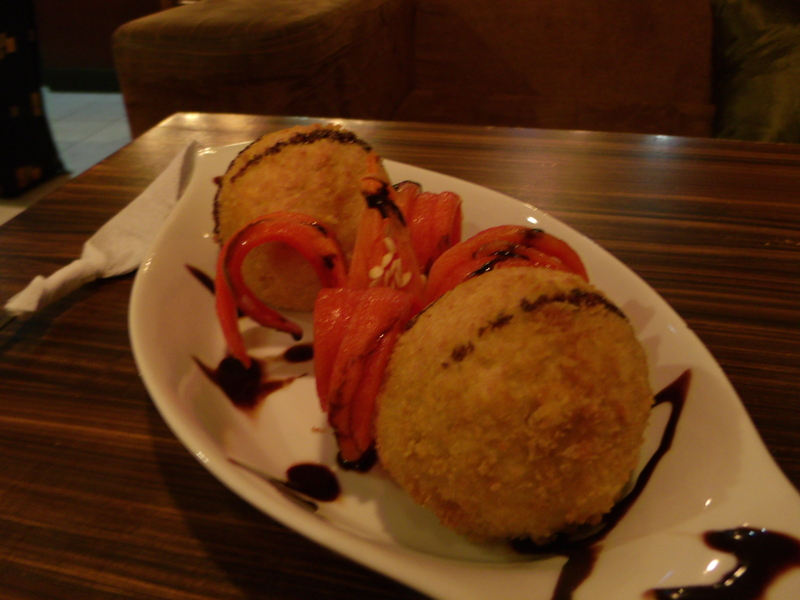 All praises for the Fried Ice Cream which came in two large balls. Strangely, garnishing was a red bell pepper flayed out to look like a flower—the same garnishing on the chicken. Bell pepper must be cheap. The coating was thin and very very crisp. The clashing textures created by hot and cold temperatures trying to outdo each other in your mouth and tongue is unmatchable. Sweet vanilla ice-cream melted as the crisp breaded crunched under my teeth. It was an “aaaaaaaahhhhh” moment. Thanks to Facebook, I finally got the directions to the Talaandig village in Lantapan. Forget about the zipline in Dahilayan, I was heading to Talaandig domain and double excited! I had almost lost all hope in getting to the village as not even the Talaandig Cultural Village website had a “How To Get There” section. It merely listed the location, Bgy. Songco, Lantapan. I was thinking of just hopping on a bus to Songco then asking around there. Then I remembered Waway Saway, the Talaandig musician, was my friend. And doubly fortunate for me, he was online and gave me directions and the person to contact. I was just to hop on a jeep to Songco and tell the driver I was heading to Waway Saway’s place. In the morning, asking around, I was pointed to large passenger jeep which was heading to Lantapan. I told the driver and a guy who seemed like the jeep conductor, that I was headed to Waway Saway’s place in Songco. They said they’d drop me off there. I had already texted Balugto, the guy Waway told me to contact. There were only about five of us and the jeep took off as I boarded it. We stopped to pick-up more passengers and cargo such as sacks of rice at Aglayan. Past a couple of baranggays, we stopped at a large terminal and waited a bit for more people to get on board. Large stretches of the road were still unpaved which made for a bumpy and dusty ride. 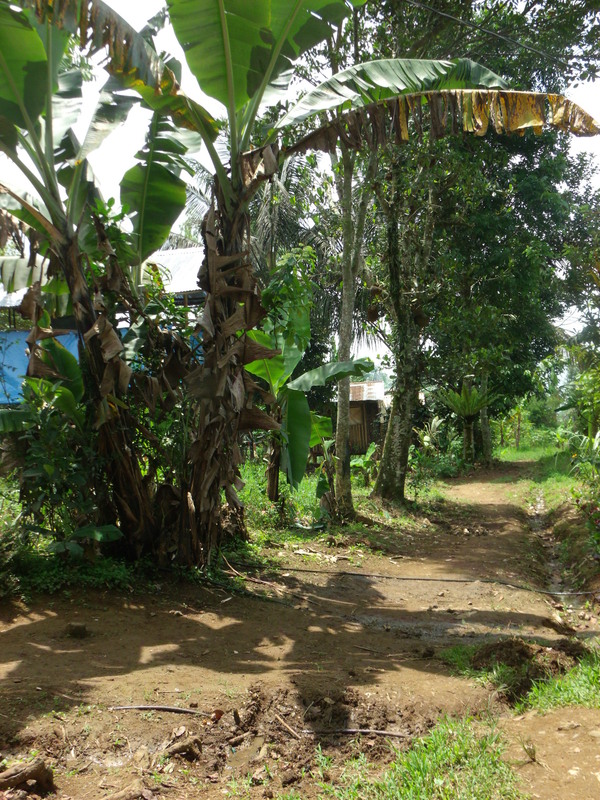 People were getting off at the different baranggays dotted with small wooden houses amidst fields and leafy yards. Now and then, there would be a low-rise school building bearing the baranggay’s name. We passed a cemetery with raised crypts with a roofs over them. It was my first time to see something like that. As Mt. 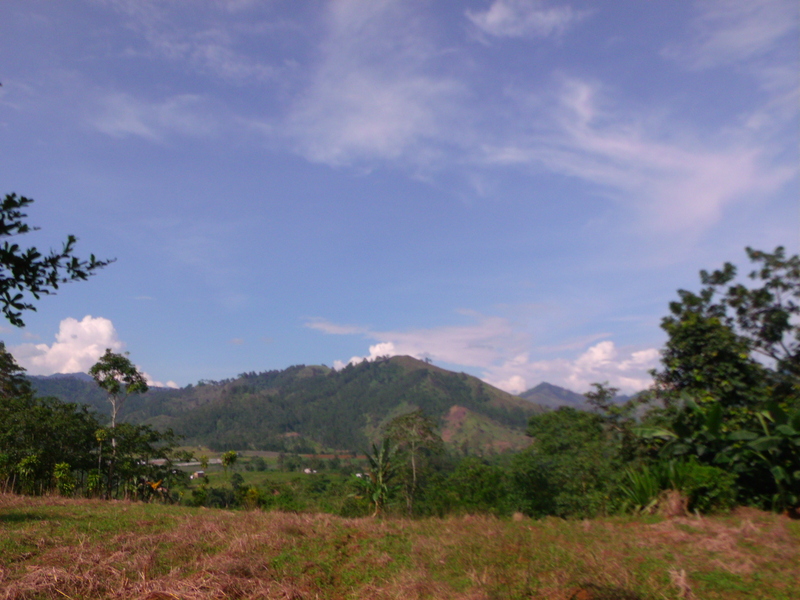 Kitanglad seemed to be getting nearer and nearer, I felt we were getting closer and closer to the village. “We’ere nearly there, ” the conductor told me. Two hours later since I boarded at the Malaybalay terminal, the jeepney came to a halt and the conductor told it was time to get off. At the side of the road, a huge sign read, “Welcome. You now in the heart of Talaandig Ancestral Territory. 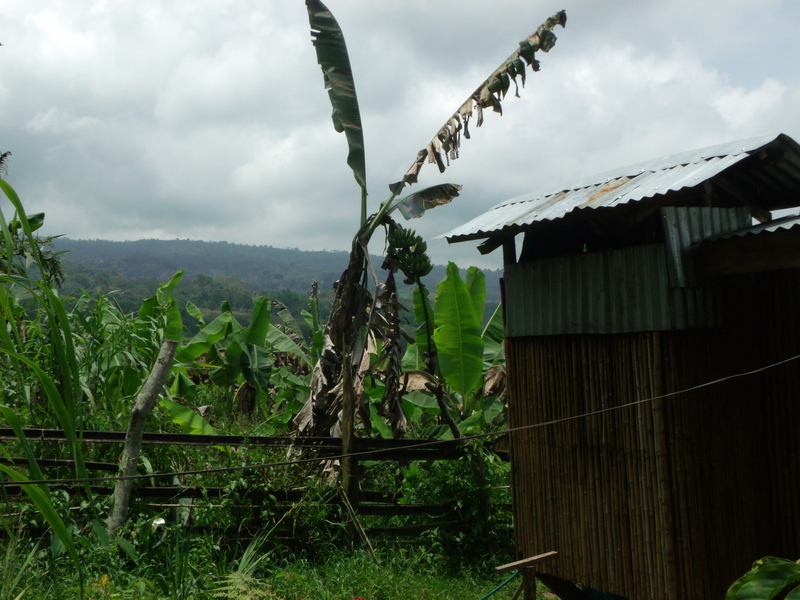 Be cultural conscious.” I called Balugto and I was instructed to just follow the dirt road. And there I sighted the village in the heart of Talaandig territory. I was met by long-haired Balugto and freezy-haired Raul. 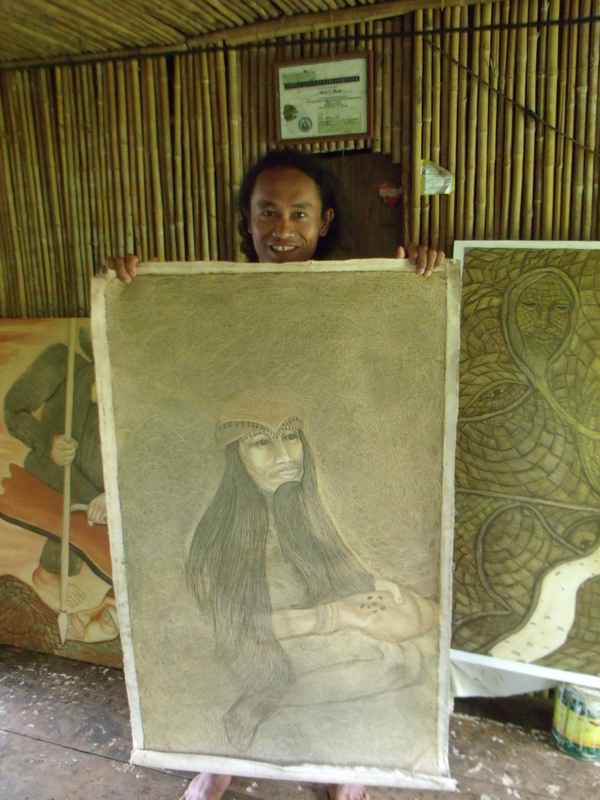 I was led to a small house where huge canvasses of their unique soil paintings were displayed. Some were still works-in-progress and I was told that a corn company had commissioned some of the works. I was introduced to the others who were also painters and musicians like Soliman, a big guy also with long-hair who was working on a canvass for the corn company. The house was like a studio where they created their soil painting. 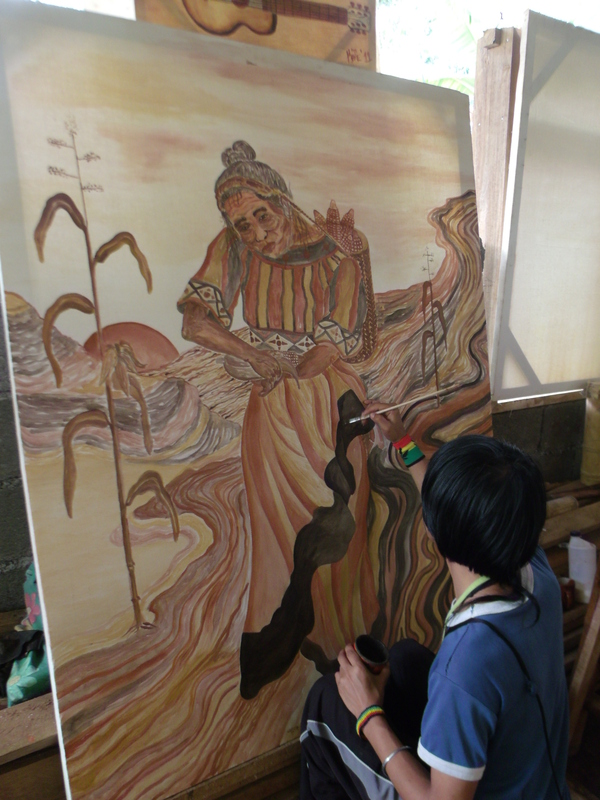 It was really interesting how the Talaandig uses an age-old art tradition to create modern paintings. I was astounded to learn that all the colors were natural pigments from the different colored soil they “harvest” from the slopes of Kitanglad. The canvass is first primed to allow the pigments to bind it. The soil is mixed with glue and a little water then viola! applied to the canvass. Once the work is done and the pigments have dried, an acrylic emulsion is painted over it to create a permanent finish. The paintings all had subjects that took on the Talaandig’s world view, philosophy, and understanding of the world. These were interpreted in various ways, realistic, expressionist, and even surreal. They were really nice and I especially liked the works of Raul, Waway Saway’s first student. His paintings had a nice texture to it and his use of flowing lines create really fluid pictures. At his house, Raul showed us more of his paintings. The spacious Hall of Peace had only a few paintings on display as much of the works were on exhibit elsewhere such as Cagayan de Oro, Malaybalay, and even Manila. I bought a pack of postcards of their artworks as I couldn’t afford any of the real thing. Though some of Raul’s works were just at Php 2,500 it still didn’t fit in my budget. I would really love to own one, though. I had told Balugto in advanced that I was an anthropologist and ethnomusicologist so I was really keen on their music. They led me to a house of young guy whose name I have forgotten. 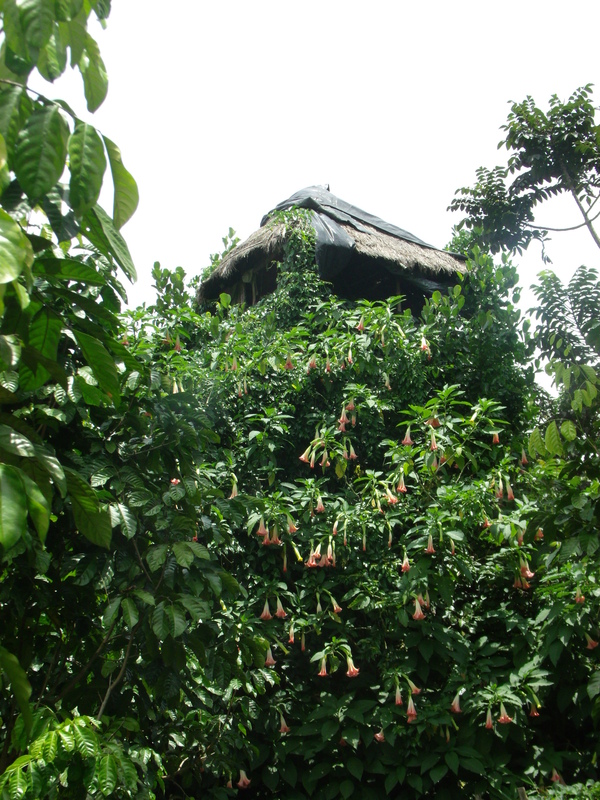 His house was still unfinished as the lower floor only had twigs and leaves as walls while a large blue sack served as the upper floor’s ceiling. He was not only a really good flute player but a skilled sculptor too. Beautiful incised designs decorated his flutes. 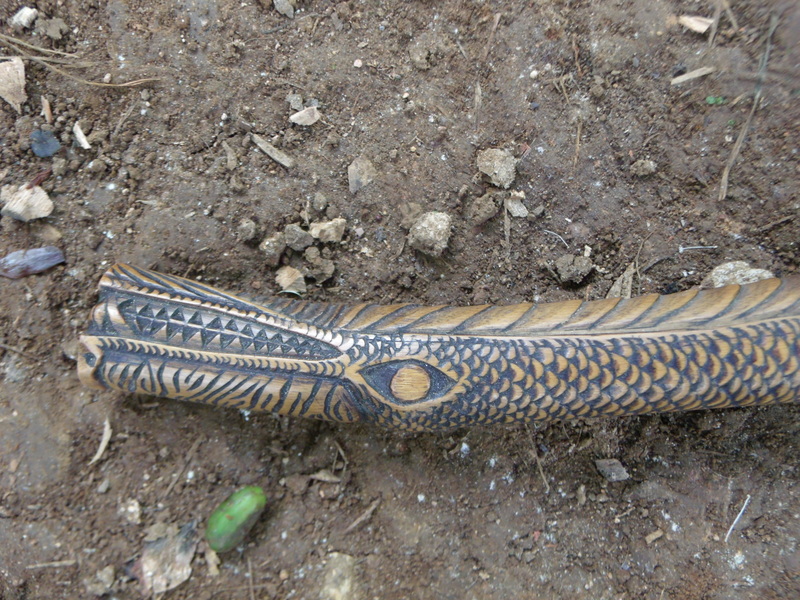 One particular flute was covered with intricate designs that was a beauty to behold. 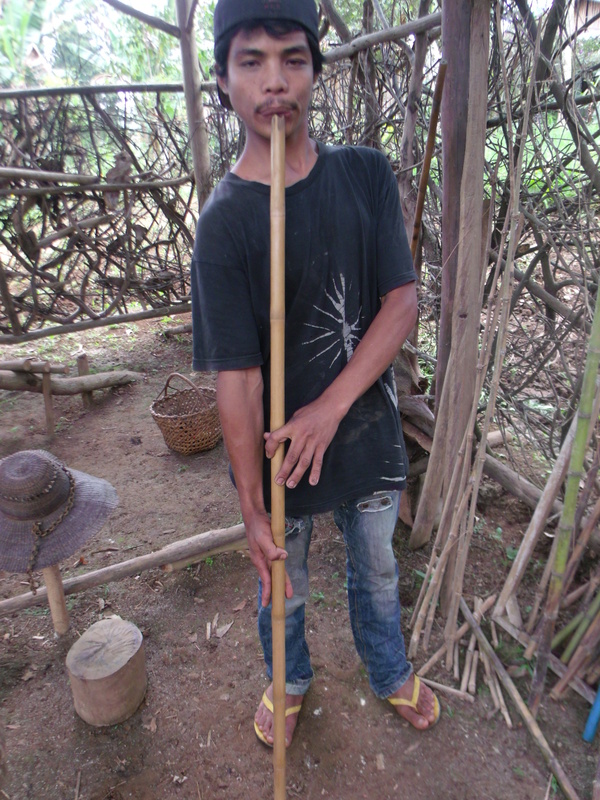 An innovator, he also had a lip-valley flute (pulalu) made out of a pvc pipe! Waway’s son, RJ joined us and he brought us to his house so I could see and listen to him play the kutyapi (2-stringed boat lute). The instrument was made by Waway’s father and has been with the family for years. It’s a beautiful piece made of hard wood with the tip shaped to resemble an animal. The frets are attached by glue rather than the traditional beeswax to keep the frets intact as the last time the instrument traveled to Europe, the beeswax deteriorated. Seated on a corner of the small house, RJ plays the kutyapi with his fingers deftly plucking the strings as his left hand travels along the frets. One string plays out a continuous drone which is characteristic of 2-stringed lute music. One piece that he plays, the others sing along to it. He also leads me to an inner room where he shows me a video of him playing the guitar which he uploaded on youtube. It’s his own music composition and boy does he know how to play the guitar! 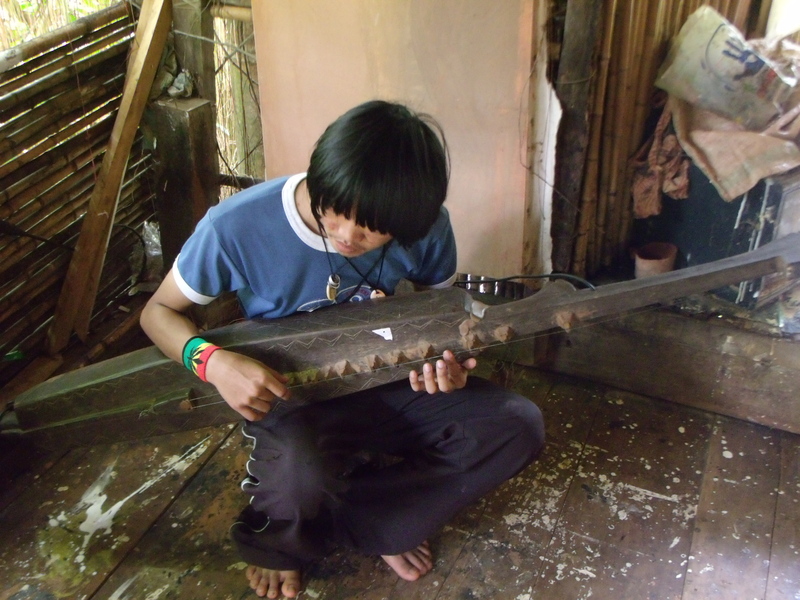 The instrument is lying on its back and his left hand plucks the string the way a koto player would while a finger on the right hand taps the strings. The music is beautiful. He also plays videos of musical collaborations his father did with some foreign musicians from Culture of Harmony who stayed with them for a week. There is a cellist and a guitarist and they play with Waway on the kutyapi and other Talaandig musicians including RJ and Balugto on the djimbe, African drums made by the Talaandig. Unfortunately, except for the specimen I saw on the video, they had none of their traditional large double-headed drum to show me. All they had were djimbe, some of which had thin metal membranes which were made for a specific market. 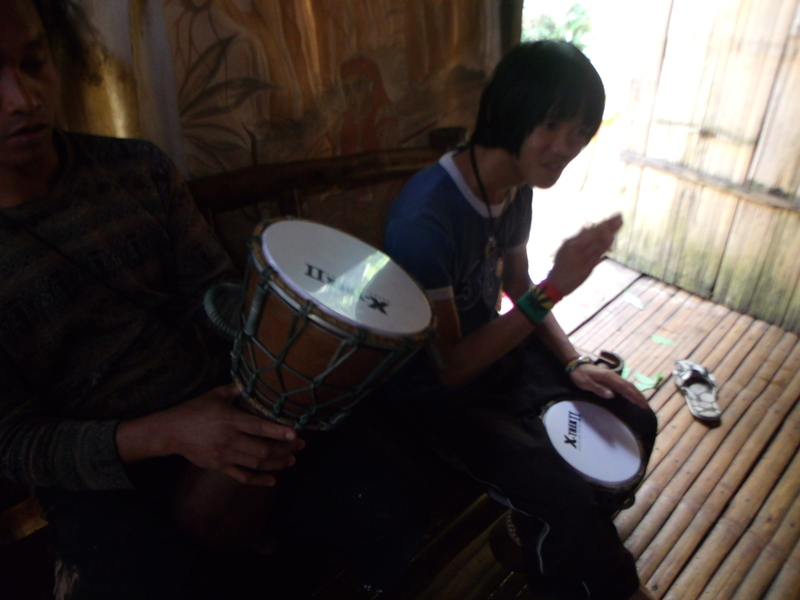 At one house, different sizes of the drum were on display and large ones were also at the art studio. As I looked at the drums and even the carved flutes, I knew that I was with an indigenous group who were able to accept cultural materials from other cultures at their own terms while they maintained theirs. It was living proof that this was a culture that was going to survive the onslaught of modernization no matter what. 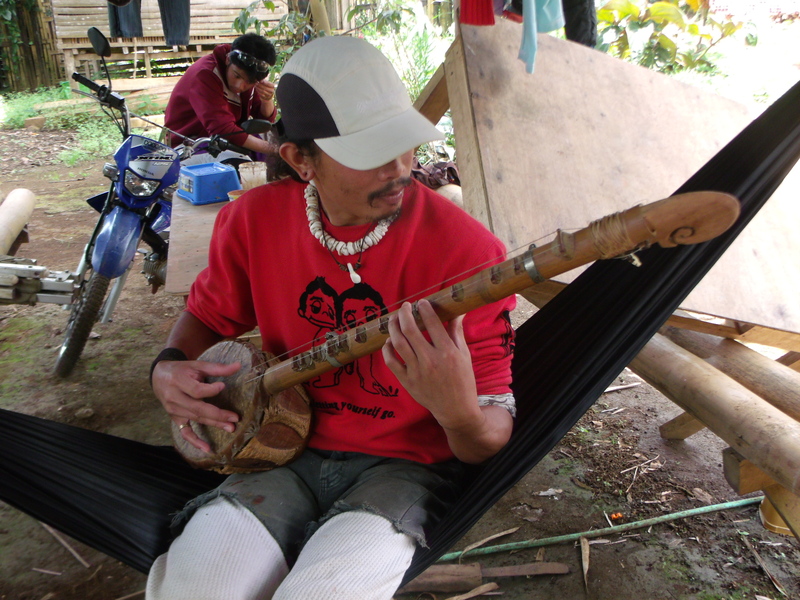 The tambeliling, a cross between the bowed 2-stringed lute (dayunday) and the plucked kutyapi invented by Waway was a most interesting instrument as it showed cultural innovation. It could be bowed, plucked, and the body thumped like a drum. Unfortunately, RJ doesn’t know how to bow it. 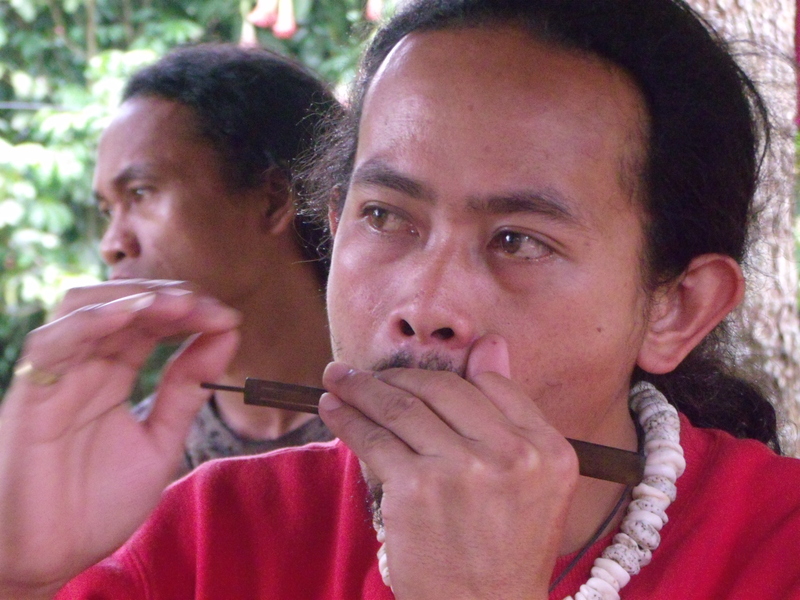 At a small shed outside the house, we listened to Soliman play the kubing (jaw’s harp). The guys were really talented, except for Raul who doesn’t play, they not only paint but play as well. Soliman tries out the "tambeliling"
We returned to the studio for lunch. While Balugto cooked the freshly-dug gabi, I looked at some necklaces they made from the clay at Kitanglad. The pendants were of important animals to the Talaandig such as the frog and the lizard. They weren’t particularly beautiful but I bought some as a way of helping the community as they weren’t even asking for any donation. The least I could do was buy some of the stuff they make such as the flutes if only to encourage them to keep their tradition. One young girl caught my attention as she was dabbling on the canvass that Soliman had been working on earlier. It was a commissioned work and they were all helping Waway finish it. Raul said that she was from Cotabato and was like an adopted child of Waway. She regularly comes to stay with them and as of that moment, had been there for two weeks learning their art. Lunch was traditional Taalandig fare of boiled gabi and its stems cooked with soy sauce and eaten with rice. Simple but delicious and nutritious. The stems had the texture and taste of abalone mushrooms. It is amazing how the village continues to try to keep its intact culture. On their own initiative, the people set-up the School of Living Traditions which teaches the younger generation their traditional music and dance. Classes are held Monday to Fridays in the morning. Every month, the elders hold an elder-youth dialogue where the youth are taught the old ways. The night before, they had just held a dialogue where they were taught how to read the stars and the skies. It was almost three in the afternoon as I made my way to the bus stop by the highway accompanied by Raul, Balugto, and the girl from Cotabato. I wish I could stay longer as they even asked me if I were staying overnight. They invited me back on October 11-16 for Talaandig Day which was going to be really special this year as there was going to be a peace pact of different Mindanao “tribes” (their term) including the Maranaw and the Maguindanaon. There was going to be lots of singing, dancing, and playing. There would be lots of traditional food too that everyone can partake of. When asked how everyone could fit in the village, they said, that there were lots of houses and people sometimes pitch tents. As we sat by the wooden benches in the shed waiting for the rickety bus to Malaybalay, I knew what he said was true. I had only stayed a few hours with the Talaandig but I have felt so welcome. Everyone was just so generous sharing what they had with me. I know I will be back. “Malay Mo” . . . “Malay Ko” . . . Malaybalay! 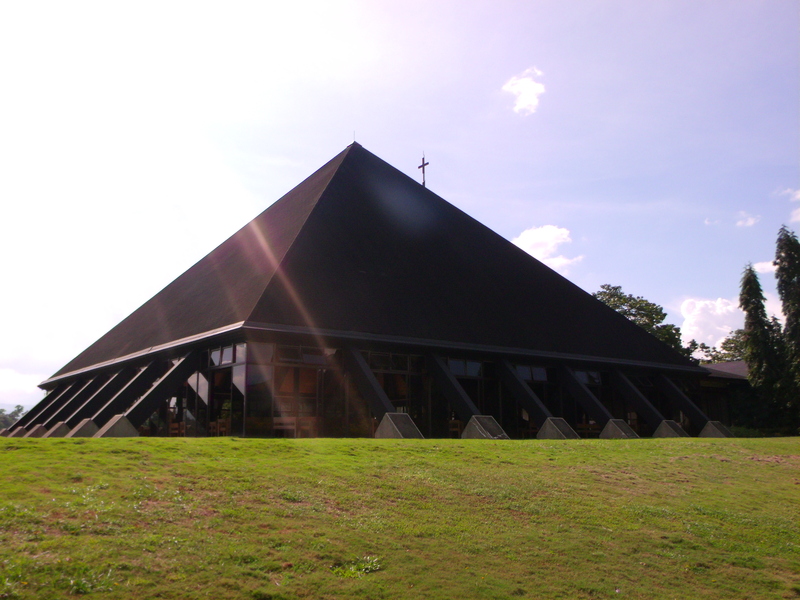 I’ve just gotten back from the Monastery of the Transfiguration up a small hill on the outskirts of Malaybalay. It was the least I could do to save the day after having my plans of heading first to Dahilayan to ride the zipline (currently Asia’s longest) skewed-up. Coming from Cagayan de Oro, the original plan was to get off at Camp Philips and head to Dahilayan Adventure Park to spend the rest of the afternoon then proceed to Malaybalay. At the Agora bus station, I was told by the security guard at Jollibee where I had brunch, that all transport to Camp Philips has since been transferred to another station. At the bus bay, an air-conditioned Rural Transit Valencia-bound bus was waiting to fill-up with passengers. The security guard said it wouldn’t pass by Camp Philips. What he did not tell me was that I could get off at the junction just past the quarantine station then take a multi-cab to there. Aaaaaaarrrggghhhhhh!!! Heading to Lantapan to the Talaandig was also out of the question as it was 3pm and there wouldn’t be any transport back. Between staying holed-up at Small World Travelers Inn and Gaisano Mall, the only option was to head to the monastery even if I wasn’t too excited about it. I flagged a multi-cab at the street beside the inn. The driver wanted Php 300 at first but I managed to bring it down to Php 250 including waiting time which was still quite expensive as my Malaybalay contact had said that it should only cost about Php 100. At this stage, I just wanted to get out of the city and do something! Maybe I expected too much from Malaybalay. I had conjured up a Sagada-like town all surrounded by hills where a few steps would lead you to patches of green. Not so. Right now, I’m in an internet cafe surrounded by punk teen-agers yelling their heads off over some online games. There is a Gaisano Mall, a Jollibee, and a Mercury Drug. Cool mountain air? More of hot smoking fumes. Well, it is the provincial capitol after all. From the highway, we turned-left to an unpaved road then climbed a hill. We headed uphill to a small church that seemed chocked by the structures surrounding it. It was empty save for a stack of plastic chairs and some scaffolds which suggested it was under renovation. I told the driver that it looked nothing like the picture which showed a large structure surrounded by an expanse of green. This one was the same pyramid-shaped and no walls but it was way too small. “Oh, that’s the new church,” the driver said. So we headed down and followed the path with the sign “new monastery” but not without stopping by the store to pick-up a small bag of Monks Blend coffee and some angel cookies. 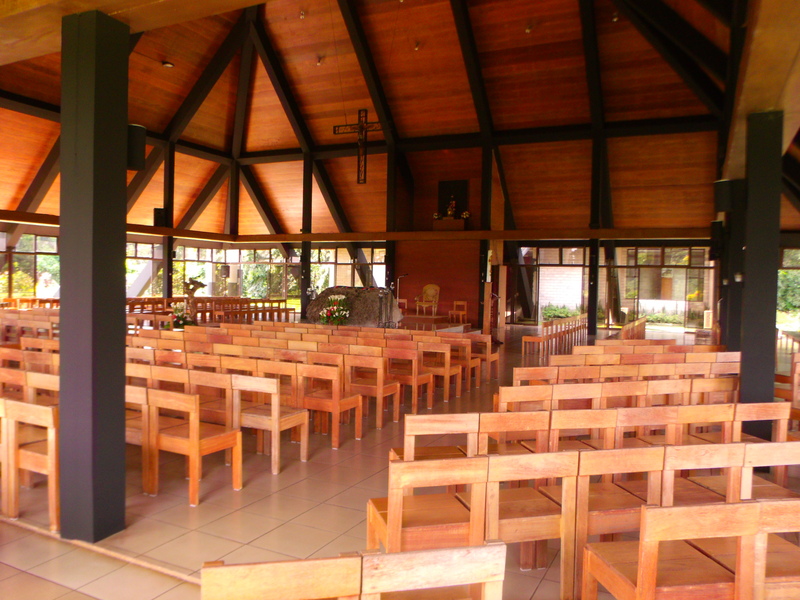 The tree-lined path wound around green fields and there it was, the pyramid-shaped church looming on top of a hill against a pretty landscape of grass and flowers with the rolling mountains of the Kitanglad range overlooking it. I had to put on a grey skirt which as I wasn’t wearing pants. A girl had just gone down the steps from the church and the security guard took the skirt from her and handed it to me. I was a bit flabbergasted. The girl was amused. The church is really pretty as everything is of wood inside. When the small group of guys had left, I was all alone and it was so serene and peaceful. It was a really perfect place for a prayer. A convoy of vans were heading-up the hill as we drove down to return to Malaybalay. 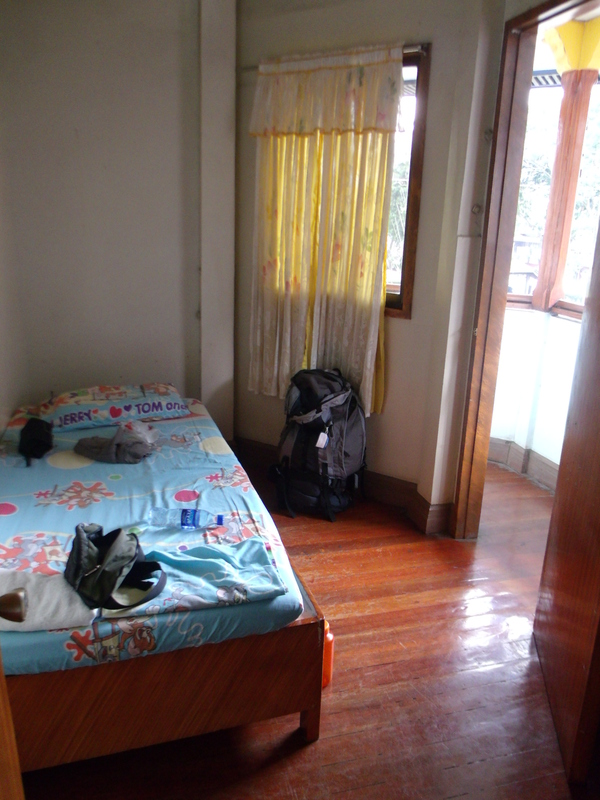 Back at Small World where for Php 380/night I have a tiny room just enough for a single bed, a small tv, and a wall fan. The balcony overlooks some used clothes shops and the plaza. It’s clean but the shared bathrooms could be better. At least the staff are really friendly and glad to be of help. There’s really nothing much to do here except perhaps try some of the small restaurants near the plaza. Mindy’s comes recommended by blogs. At least the attached internet station at the inn is cheap (Php 20/hour) and fast. I should have at least checked a map of Bukidnon or double-checked with someone before I got on the bus to Valencia from the Agora terminal in CDO. I was really looking forward to this first visit to Bukidnon. After the rebel raid scare in Medina in Misamis Oriental a few days ago, I was glad to be out of there and heading here. Medina was a nice quiet place by the sea with lovely Duka Bay but I was a little sleepless and couldn’t help imagine hearing gunfire as the place we were staying at was so close to the municipal hall which was just strafed with bullets the night before I arrived. This morning, I finally heaved a sigh of relief as the van brought me and a couple of others back to CDO. And here I am heaving a sigh of frustration as I survey my surroundings.